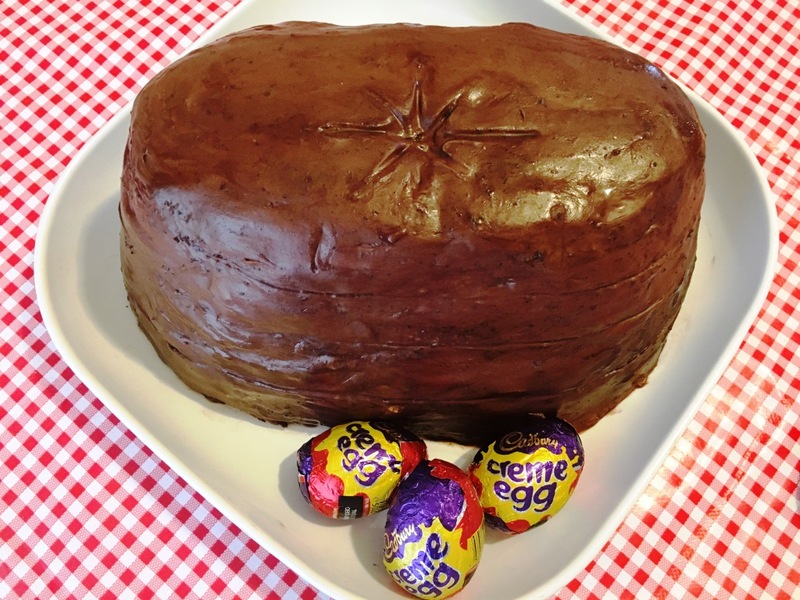 With only a week until Easter, the world seems to be under the usual magic spell cast by Cadbury’s creme eggs – and who can blame them! 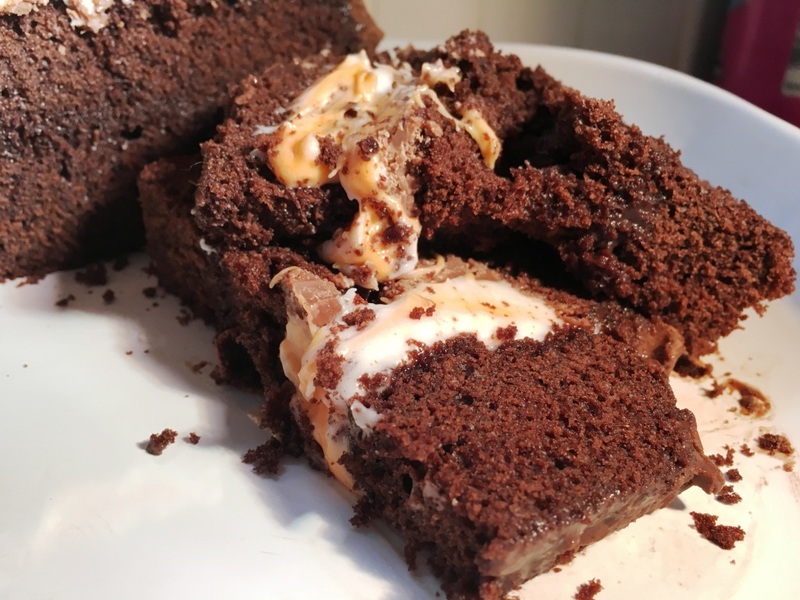 My two previous Easter posts – Creme Egg Cookie Pizza and Creme Egg Mini Cheesecakes are more popular than ever. 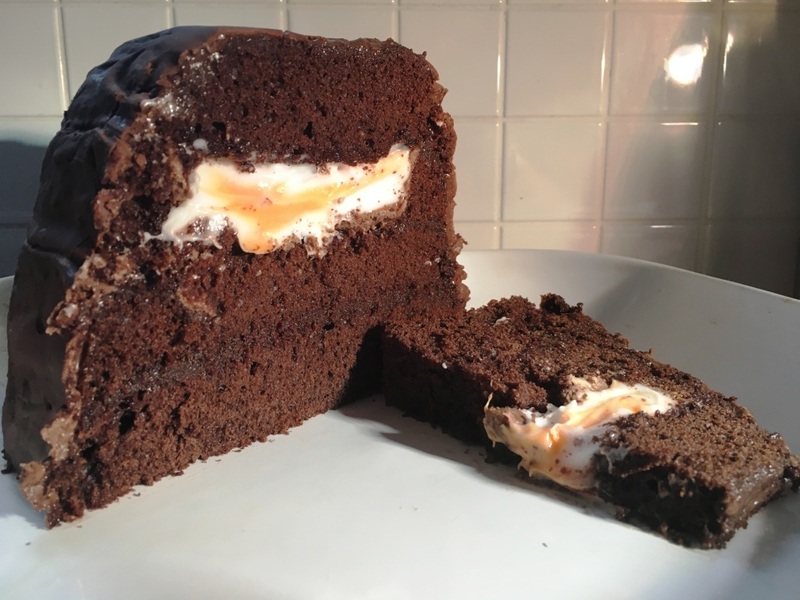 Check me out (and some other amazing suggestions) over on Buzzfeed’s ‘17 Creme Egg recipes that should be illegal‘! 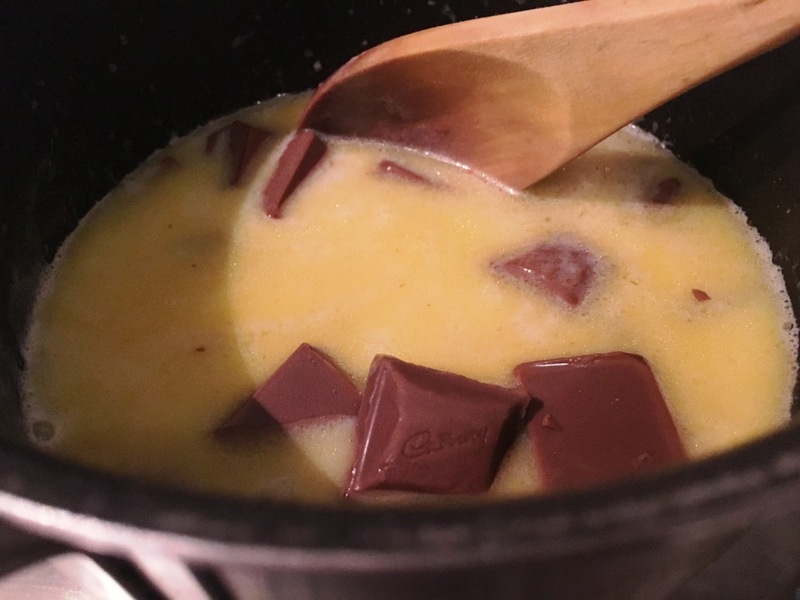 – Divide the mixture into 3 rectangular tins of slightly decreasing size. I used 12 x 7 inches, 10×7 inches, and 9×6 inches. If you don’t have exactly these sizes it doesn’t matter at all – work with what you’ve got. 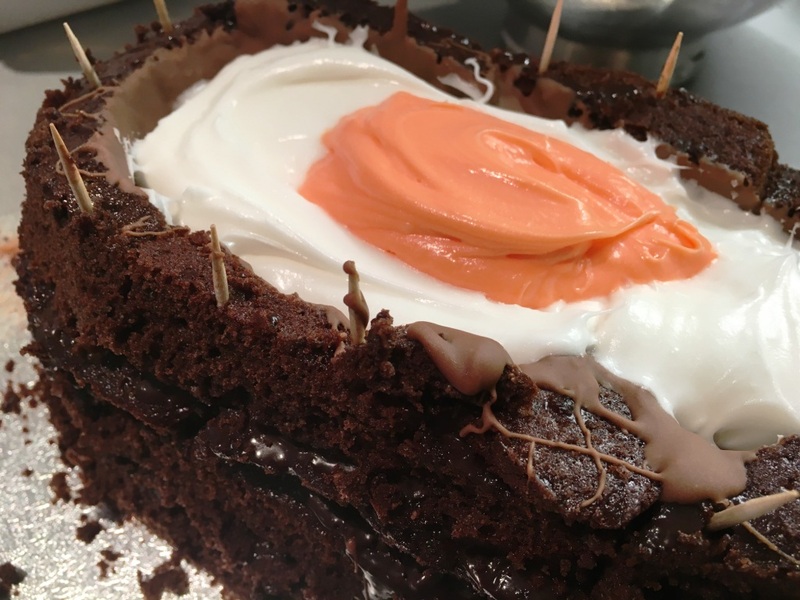 Your layers will be a bit thicker/thinner depending on the sizes, but you can easily shape the ‘egg’ still. 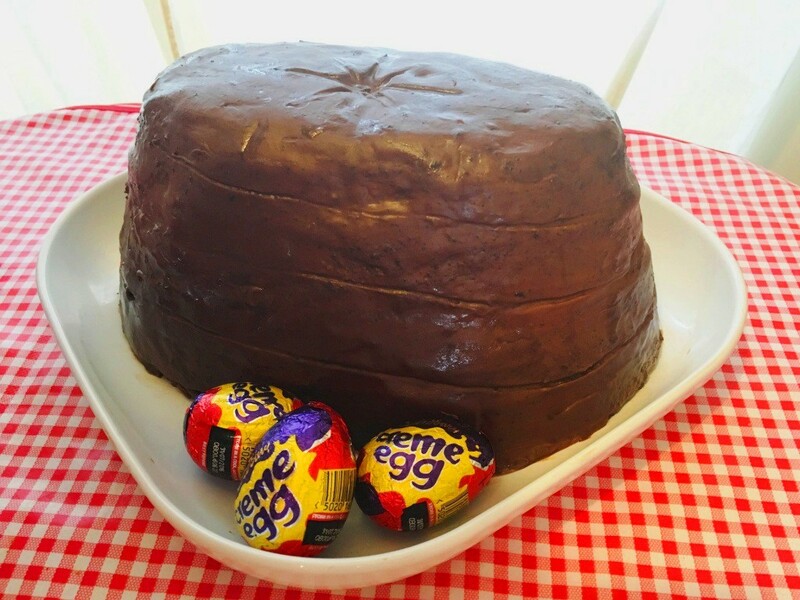 – Once the cakes are cool, cut the largest into an oval/egg shape using a serrated knife. Make a paper template beforehand if you’re worried about doing it freehand! 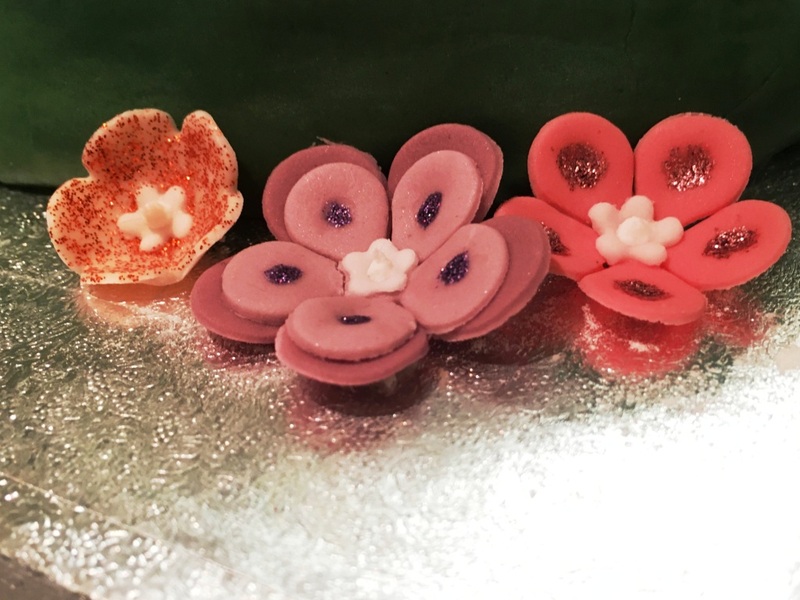 Be sure to keep the offcuts (don’t eat them all!) as they’re needed later on. 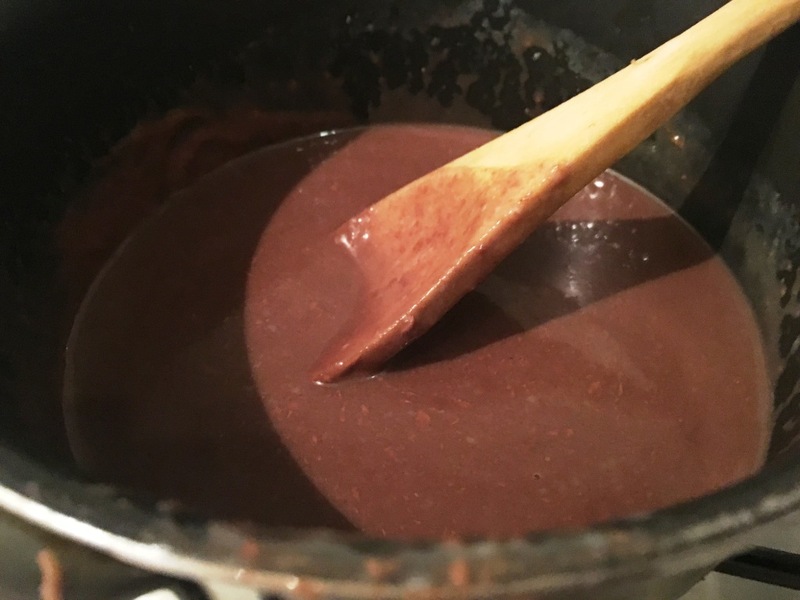 – Using the back of a teaspoon, coat the entire inside of the cake (bottom and sides) in chocolate, being sure not to leave any gaps. 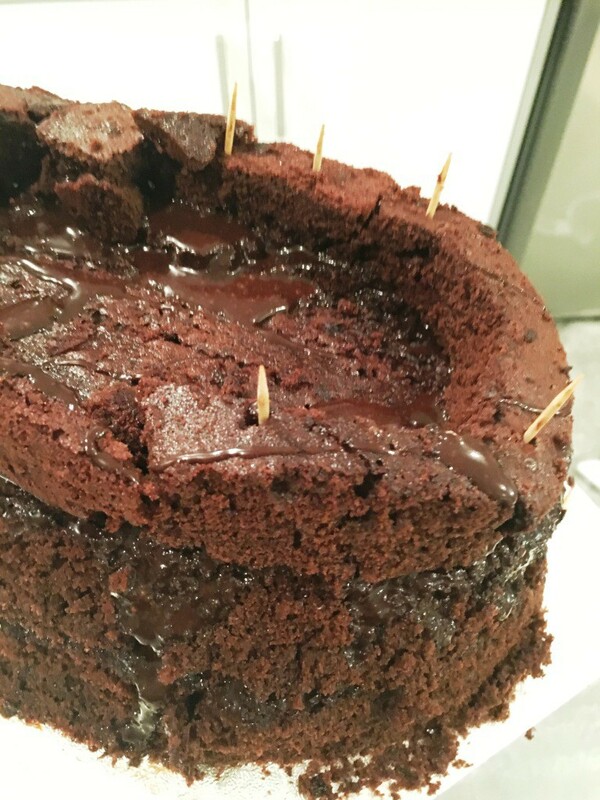 This will form a sealed space for the fondant to sit in – so it won’t soak into the cake or leak out the sides. 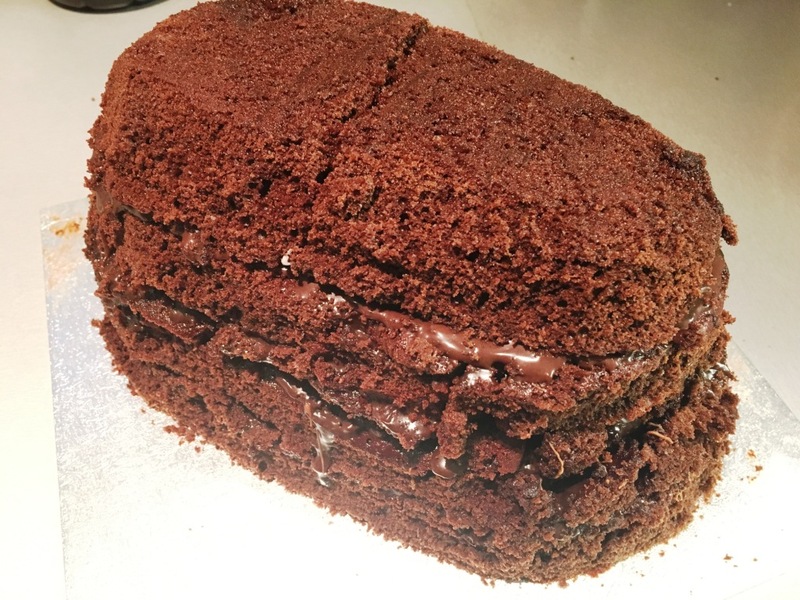 Remember there’s no such thing as too much chocolate, so add more if you’re not sure the edges are sealed or not. Refrigerate again until the chocolate has set. 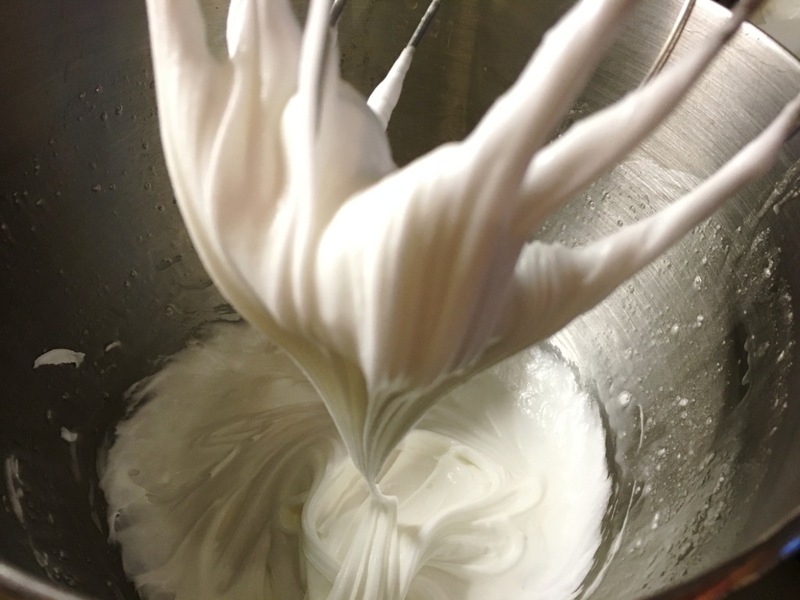 – Spoon the remaining white fondant over the orange, to cover it. 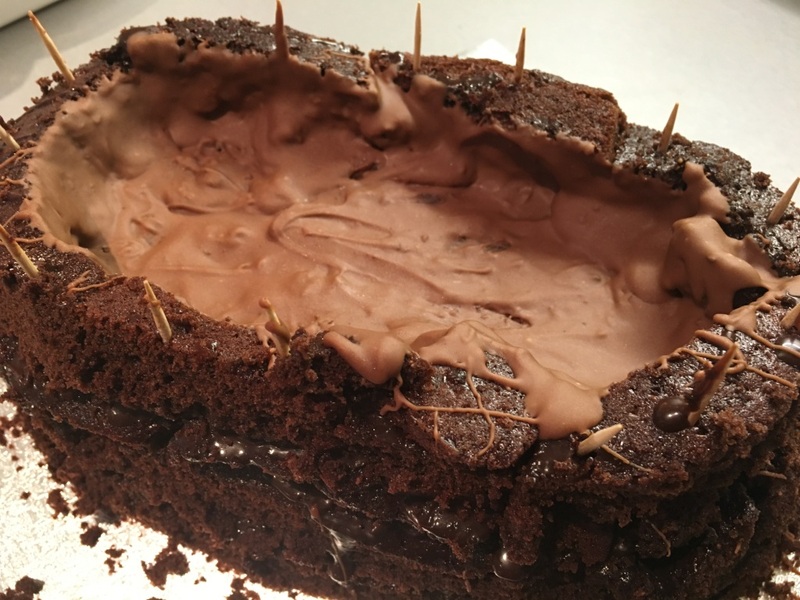 Don’t feel you need to use all the fondant, if there’s too much for your cake. You don’t want it spilling out the sides! 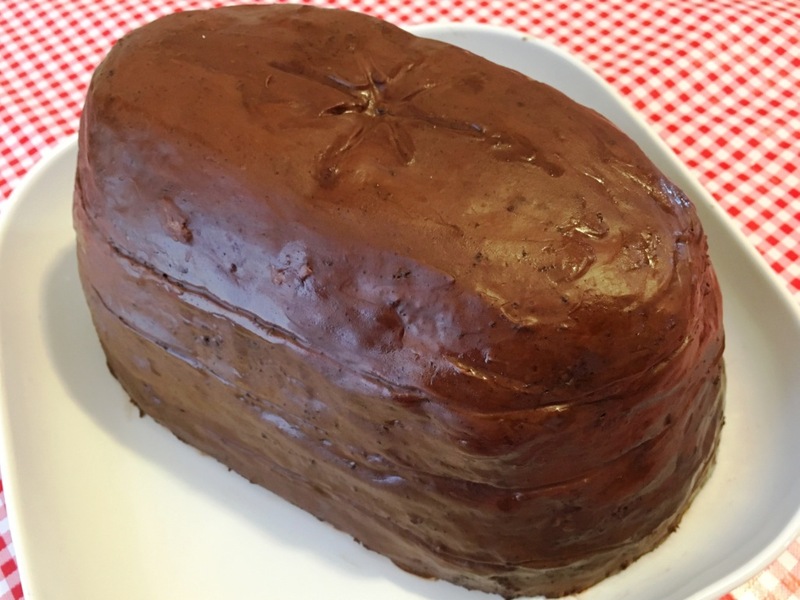 – Cover the cake in the remaining chocolate icing – I’d recommend a thin crumb coat first, refrigerate for half an hour, then a second smoother coat. 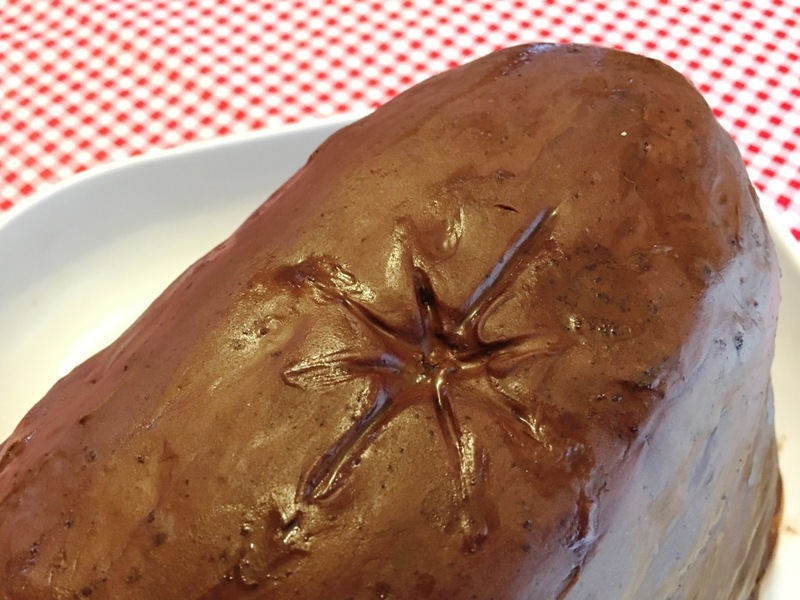 Finish with a star design on the top and lines around the outside, using a thin knife. – Chill until ready to serve, slice, and enjoy! It’s been ahem a few months since my last post – what can I say, things got rather busy! 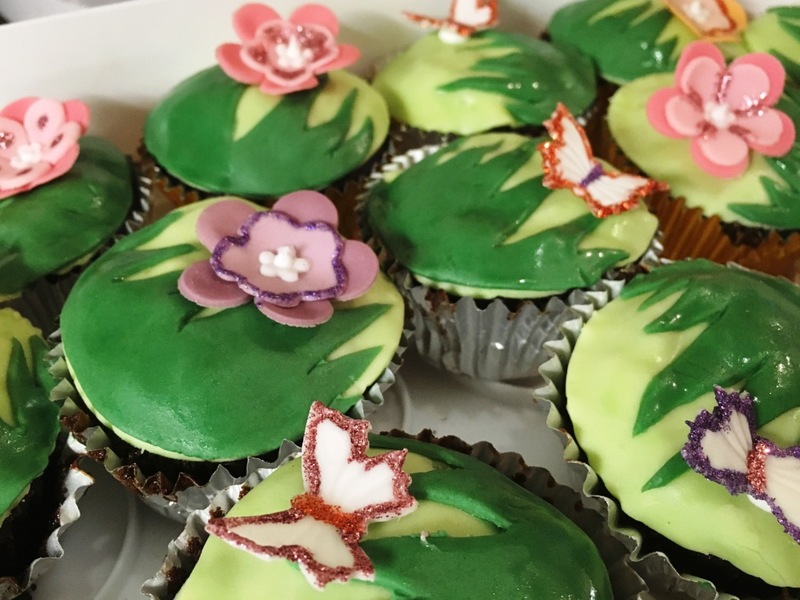 Rest assured I’ve been busy baking and have plenty of recipes photos waiting to be shared. And how could I not share this wonderful excuse for a celebration. 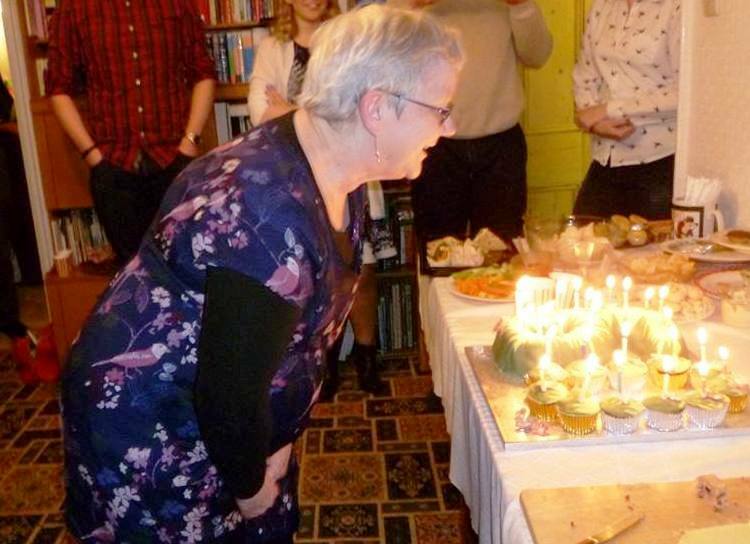 Last month was my mum’s 60th birthday (sorry mum, it’s public knowledge now!) and of course I was tasked with making the all-important birthday cake. I used my number and letter pan to make the two number-shaped cakes. Both were madeira cake as it makes a great stable base for decorating onto. One was vanilla flavoured with a blueberry and raspberry buttercream, and one was lemon with a lemon buttercream. Even though the birthday party was only a few weeks ago I can’t actually remember which was which! 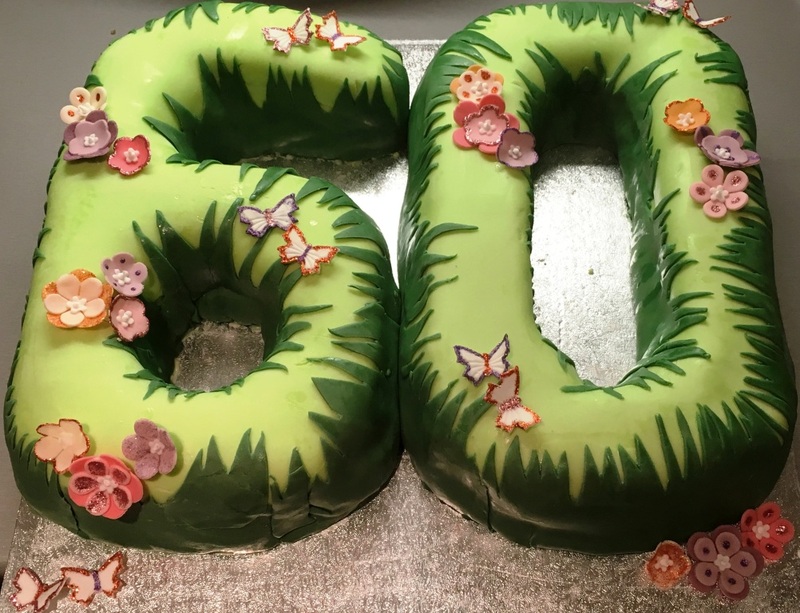 Last but by certainly no means least, the cake was finished with fondant flowers and butterflies, in bright spring colours of orange, purple, and pink, edged with edible glitter. These took up most of my evenings in the week leading up to mum’s birthday, to ensure they were fully dry and set in time. In the absence of enough flower-forming cups, I made temporary ones out of a strong tin foil. 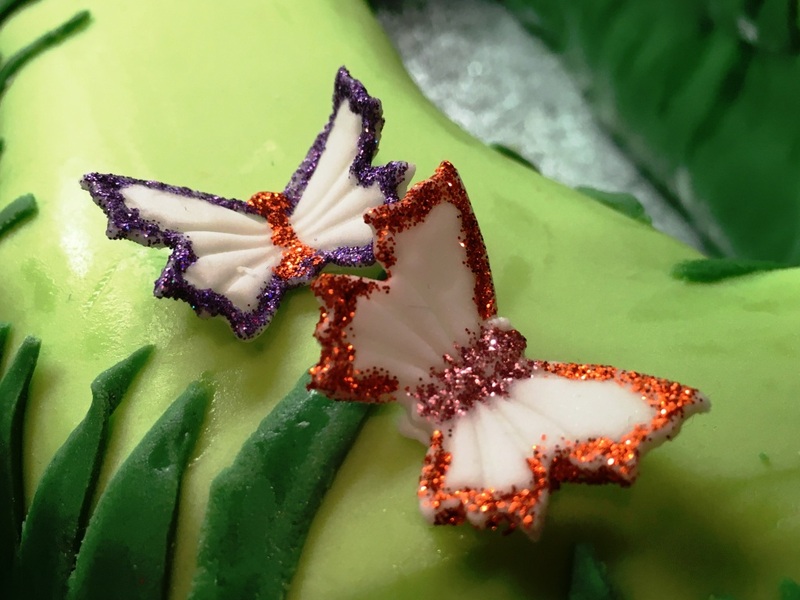 This meant all the butterflies could set in a v-shape, and gave the flowers a rounded-3d effect. 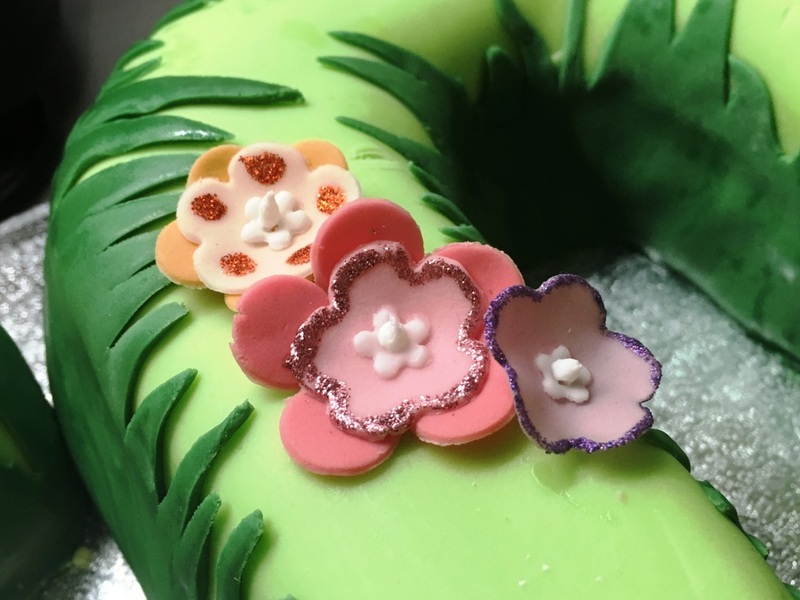 The centres of the flowers were filled with a tiny piped circle of white royal icing. 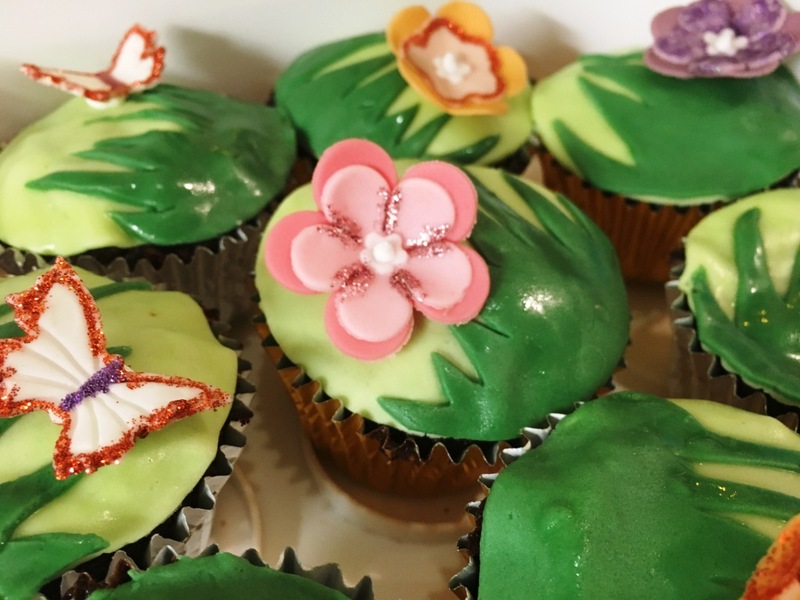 As ever that’s not the end of the story – just the small matter of 50 matching cupcakes for the birthday party! These were chocolate, half of them filled with caramel, and half with nutella. 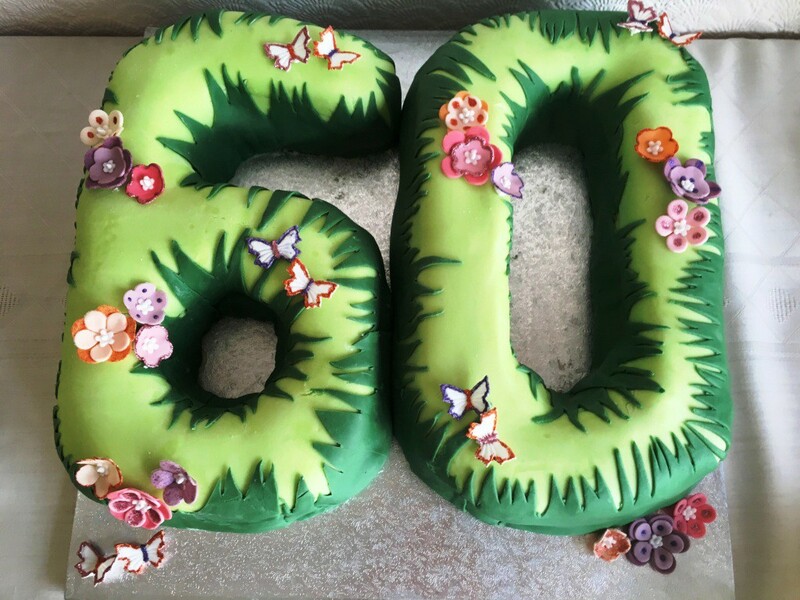 To top I cut matching circles of the pale green fondant, and curved pieces of the darker green grass, before finishing with butterfly and flower toppers. 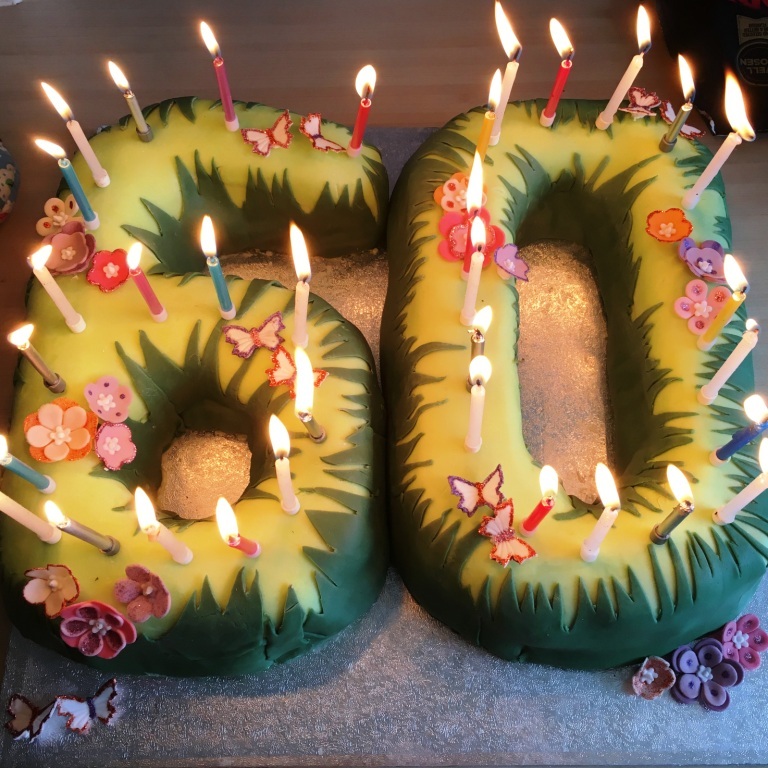 The party was great fun and the cakes went down an absolute treat – it was of course a pleasure to make them for my lovely mummy! ❤ Happy birthday again!